You have to have a heart of steel to resist these masters of the beg, dogs who know exactly how to get what they want using all the techniques in their armory! We here at Bored Panda have made a list of the funniest and most creative doggy beggars, scroll down below to check them out for yourself and don't forget to vote for your faves! Omg. Wish there is a video of that action! Smart dog! Bad dog, but smart dog. Ha ha ha, Cirque du Soleil would like to have him! I am so hungry I can no longer hold up my head, please give me food humans! The big one is a saint. #9 Don't You Hate It When Strangers On Flights Want You To Share Your Snacks? No, I don´t. Can´t resist that face! Ahaha. Little hooman is joining the other team. Aw, no!! Poor little cutie. That just is so adorable and sad at the same time. Though I had a blind dog and she always knew where I was as her nose was very effective! Poor ole doggy. Need to feed him sooner! He broke the system, BIG TIME! Also, I wanna boop that nose. Boing, boing, boing... Joey's efforts to get ON the table were not going to plan. I´d buy him a burger! #22 "Ok Sorry. Not Sure What Came Over Me"
I'm not going to say you asked for it, but why did you put a bib on the dog if you didn't want him to eat during dinner? Doggo in stealth mode... Commence steal-sausage plan! #24 "Do Not Look At It, Do Not Look... It's A Trap"
Poor Aussie, being tortured by bad humans. Hmm - the little one looks a little too determined! It is bacon though. Who can say no to those eyes??? Bowl malfunctioned - is empty! #30 I Know What's Up There! That is one pathetic face..
Aw! Who can blame the poor doggo! That blurry wagging tail, so cute! Well, you know that would happen so it must be deliberate. I'm distracted by all the legroom! Do you see the dog licking his lips? 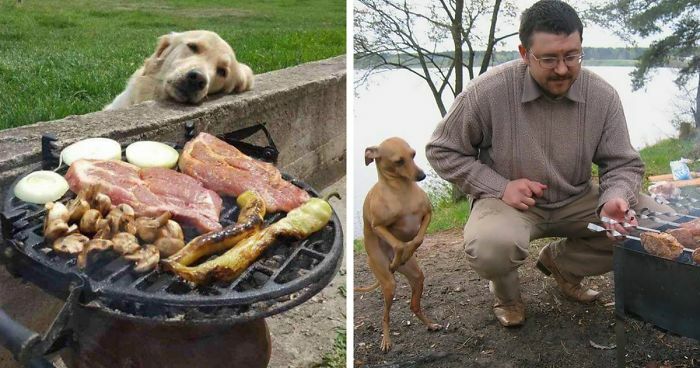 Dogs are very good at telling the time when it comes to food! I'd beg for those too... damn looks yum! Oh another one of those poor little blind things! Give that cat all the noms! "the good boy tax" !!! In stalk mode doggo is invisible anyway. I want this hot dog this much! "This is a jolly good neighborhood to live in!" 2nd pic: "Help! I'm gonna fall! Quick! Cheetos let dogs fly! Give me some!" Just a friendly reminder: sugar is very bad for dogs and cats (can cause blindness and liver failure) and chocolate is lethal (the toxin theobromine in chocolate isn't metabolized and builds up in their system, causing death if it reaches high levels - humans can easily metabolize this but not our furry friends). It's adorable! She is a clever dog! #61 Can... Can I Get Some Of That? Gimme it quick or I'll have your hand off as well! Where is she dining? HEAVEN!? I was thinking Ewok..but okay. True, but imagine how it must be for a dog to live above a street full of restaurants. Poor thing! Look at its' face! The dog's face is as runny as the sauce. It's the 'I'm half starved and it's all your fault' look.